You’re looking for a unique summer adventure, and an experience to help you grow. EDUCATORS. ENVIRONMENTAL STEWARDS. OCEAN EXPERTS. Sea Education Association is the leading environmental studies program focused on the ocean. 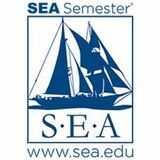 Sea Education Association (SEA) was founded in 1971 by Corwith Cramer, Jr. and Edward “Sandy” MacArthur. Their passion – teaching people to “love the sea” – continues to drive SEA to this day. 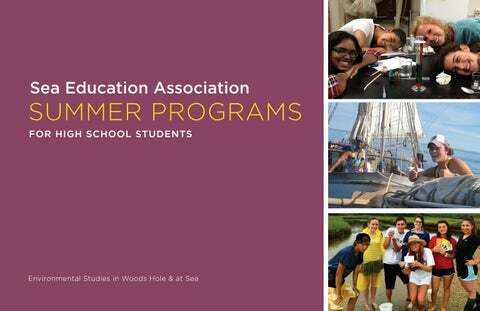 In addition to our flagship undergraduate study abroad program, SEA Semester®, SEA is pleased to offer multidisciplinary high school summer programs for motivated and qualified students. Learning by doing is a powerful element of SEA’s approach to education. For over 45 years, SEA has created ocean scholars, stewards, and leaders. Our alumni return home with a broader sense of the ocean’s importance to our planet and the critical need to preserve this precious resource for future generations. They also return with a deeper understanding of their own potential and ability to influence our world. SEA Expedition is a field-based program in which students participate in every aspect of an offshore sailing and oceanographic voyage. SEA Expedition takes place aboard the SSV Corwith Cramer, SEA’s Atlantic sailing research vessel. No sailing experience is required! Guided by professional scientists and crew, students gain hands-on experience, conduct marine science and policy research, operate a tall ship, and develop lifelong leadership and teamwork skills. Students stand watch as active crewmembers and are involved in all scientific and sailing operations on board. As busy as things are, there’s always time to make new friends, keep a journal, climb aloft to enjoy the view, and be inspired by the ocean environment! Our scientific voyages focus on one or both of two protected offshore marine environments near Cape Cod, MA – Stellwagen Bank National Marine Sanctuary and the Northeast Canyons & Seamounts Marine National Monument. Both are important habitats for rare and endangered species – whales, turtles, and seabirds – along with countless other marine organisms. Data collected by SEA Expedition students, ranging from acoustic recordings of whales to chemical nutrient measurements, help provide critical annual monitoring of these protected areas. Research is augmented with discussions of the history of and policy governing the protected areas. SEA Expedition’s sail training and seamanship components challenge students to form a team and sail a tall ship at sea. Teamwork, leadership, community, and a sense of shared mission are core values of all SEA programs. Students take responsibility for all shipboard operations to cultivate these life skills. and built as an educational platform. It is a U.S. flagged, inspected, and regulated vessel, and designed specifically for SEA with student and crew safety foremost in mind. SSV Corwith Cramer is United States Coast Guard certified and regularly inspected for ocean service. As a U.S. flagged Sailing School Vessel (SSV), the Cramer meets or exceeds the safety requirements for its USCG and ABS Class designations and has all required equipment for navigation and emergency situation response. The crew is highly trained, experienced, and fully licensed by the USCG. Daily contact is maintained with SEAâ&#x20AC;&#x2122;s office in Woods Hole and the vessel can be located at anytime. For more information about our commitment to health and safety, please visit www.sea.edu/safety. This shore-based program at SEA Headquarters offers motivated high school students the opportunity to study the marine environment from a variety of perspectives – scientific, historical, literary, and nautical. Participants live and study at our campus in Woods Hole, Massachusetts. Academic programming is scheduled throughout each day, including on most weekend days. Coursework includes lectures, discussions, laboratory activities, and field trips; all introducing students to the study of oceanography, the history of humanity’s relationship with the oceans, and modern maritime issues. Teamwork, leadership, and sense of community are the underlying values of SEA’s academic curriculum. Participants not only grow as students, but as global citizens and individuals. communication, thoughtful participation, and a planned approach to tasks. supervised by an adult house leader who also serves as a Teaching Assistant on shore. Groups will work together to design, plan, and execute projects in the field, lab, and classroom, and the class will live as a community on the SEA campus for the duration of their time in Woods Hole. Life in each cottage revolves around its common/ dining area, where students help prepare meals, share cleaning duties, and live in community with one other. After dinner, there is an evening activity, followed by quiet time for study and using the library, student lounge, and computer facilities. This environment is conducive to the underlying goals of teamwork and community building. The house leaders organize evening and weekend activities which may include special evening musical entertainment, and movie and popcorn nights. Students often join together to play volleyball, soccer, and Frisbee, and to participate in team-building activities. 1. Online Application & Application Fee 2. Original One-Page Essay 3. Official High School Transcript 4. Academic Reference Form For more details, visit www.sea.edu/high_school_programs.